That's really where is truly room for imagination, so it is in fillings for stuffed peppers! Stuffed peppers – a fertile topic for any hostess during the summer-autumn period. The filling for the peppers can come up with literally on the fly based on the available products. For any recipe, rinse the peppers, as desired, cut in half or cut the stalk with a sharp knife, remove the seeds. Stuffed peppers can be baked in the oven, put in a deep pot or quickly cooked in a slow cooker. The number of ingredients in the fillings for peppers, use arbitrarily according to your taste. The rice in the stuffing, it is desirable to use a semi. If the peppers cook in the oven, sprinkle the tops with grated cheese, cheese mixed with mayonnaise. Ready stuffed peppers garnish with greens. Classic stuffing with minced meat. Grate carrot, slice onion. Take any meat, the sunflower, pepper. In forcemeat add the egg, add the carrots and onions, mix. Onions and carrots can be pre-fry, and it is possible raw to make into mincemeat. Add in the mince and rice and a spoonful of tomato paste. To know exactly what minced meat in enough salt, need to cook on a small frying pan small flat cutlet. Filling with the seafood. 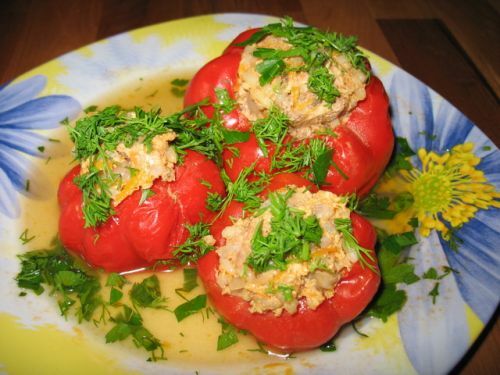 Tomatoes without skin, finely chop, mix with fried onions. Add the rice, boiled shrimp or chopped squid. Add olives or black olives, cut into slices. Salt and pepper, squeeze a few drops of lemon juice. Mushroom filling. Any mushrooms cook, chop, fry with chopped vegetables: onions, carrots, eggplant, zucchini. Eggplant is desirable to pre-soak in salted water sliced. You can add to the total weight of the sliced sausage or ham. Cabbage filling. Macrosite the cabbage, fry with onions and carrots. You can add in the pan the tomato paste. Fill in the total weight of the rice, chopped boiled eggs, cloves of garlic, a little salt. You can add grated cheese. Cabbage for the filling, use white or color. The cheese filling. Chop fresh tomatoes, cheese, garlic, greens, add a couple tablespoons of mayonnaise, a raw egg, stir. Cheese in the filling, use any which you like.